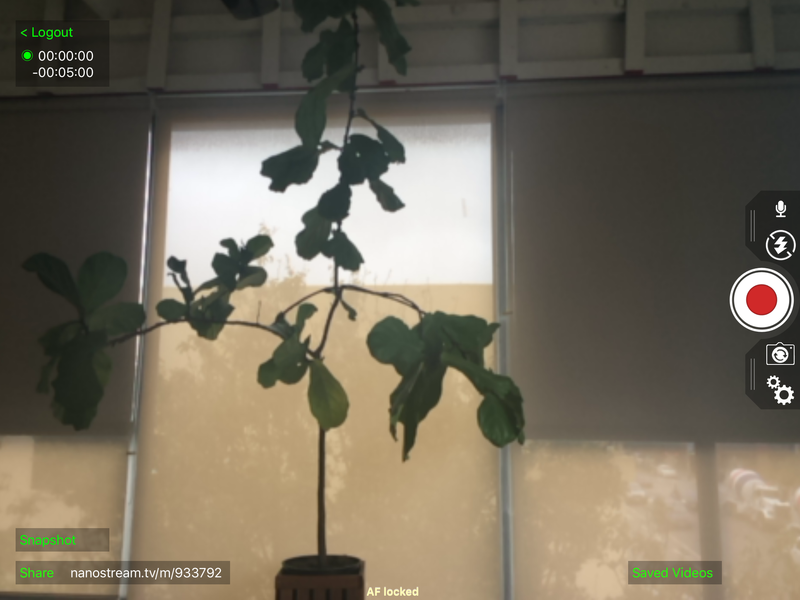 Mobile Live Streaming App: How do I stream using NanoStream? This post will guide you through streaming from an Iphone or Ipad with the live streaming app Nanostream. 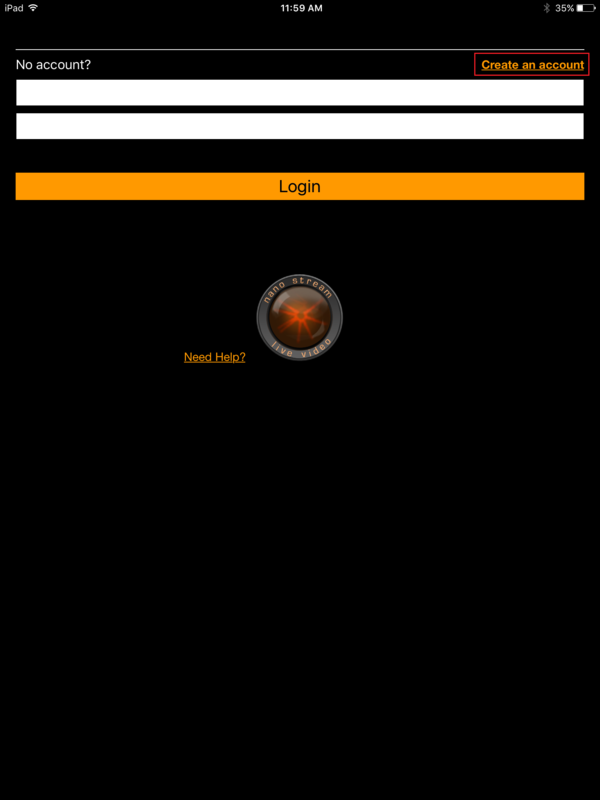 Note: There is an Android version of the NanoStream app as well. However, currently it does not work with Dacast. First, you need to download the NanoStream app on the device you want to use. After installing it, launch the app. You will arrive at a login page that will give you the option to create a new account. The creation of a new account requires your name, an email and a password. After the registration you just need to use these credentials to log in and use the app. The first is the ability to mute. The third one is to start streaming. The fourth is to change the camera (i.e. use the front or back camera). The final icon is a two gears icon as seen on the right . Now, you need to click on this gears icon. This will launch a setup screen as shown below. Camera to choose your source. Video to plan a local recording of your stream . Advanced settings to set up the quality of your stream . Server connection to connect your stream with your DaCast channel. Information on the Nanostream app. 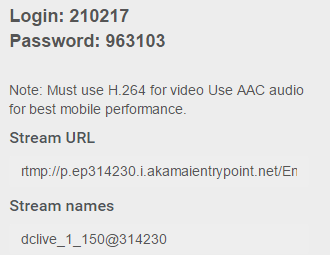 First, let’s connect your stream to your DaCast channel (SERVER CONNECTION section). It’s now time to sign into your DaCast account in order to fill out these fields. Now you need to get the necessary information from your DaCast live channel. If you haven’t already, create a live channel in your account. Now navigate to ENCODER SETUP. This is a three-step process, and note that the bitrate and resolution you enter in the first step are ignored in this instance. Now that you have connected your stream to your DaCast channel, let’s focus on the settings of your stream. This is the ADVANCED SETTINGS section. You’ve reached the Final step to get setup and start live streaming! Before the fun begins, you will want to configure the bitrate at which you’ll stream. By default, it’s set to broadcast at 500Kbit/s, which should be fine. Most users set the quality between 350Kbit/s to 750Kbit/s. To best evaluate at what bitrate you can stream, we recommend you go to Testmy.net on the device you plan to stream with. Once there, do an upload speed test. Aim for a bitrate that is half or lower of your upload speed. For example, if your upload speed is 800kbps, stream at 400kbps. You will need to factor in other elements, like distance from your router and whether its a shared network . Plan to do a variety of tests to compare all the results. If you see freezing in the feed, it means the bitrate is too high. The resolution is set up to 480p by default. This is perfect as well, although another typically ideal resolution is 720p. 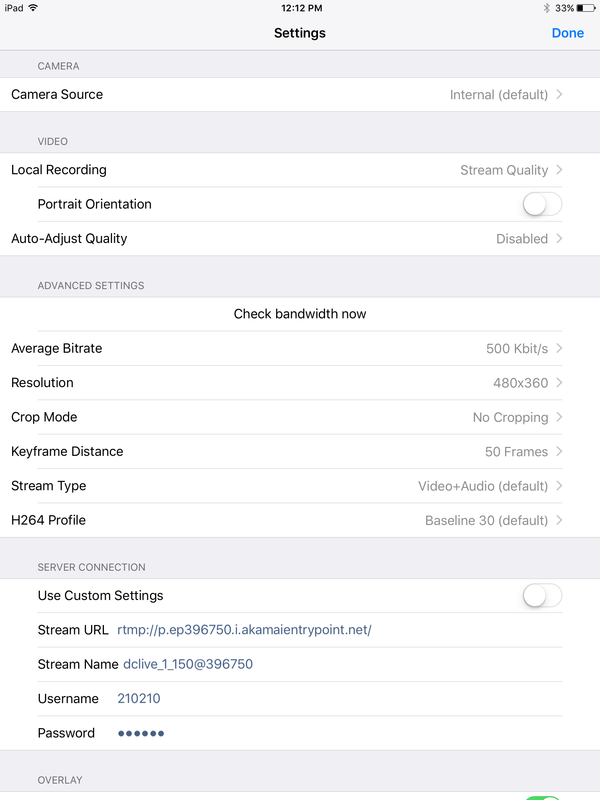 You also have the option to set up the crop mode, the keyframe distance, the stream type and the H264 profile. Unless you want to customize the settings, the default settings are ideal. Once you are happy with all of your settings, please click the DONE button in the top right of your screen. You can now start streaming by clicking on the red button. That’s it! You should now be streaming live video from your smartphone or tablet with this live streaming app! Please note that the maximum length of a stream using the NanoStream free demo is 5 minutes. For a longer stream, feel free to contact their sales team to get a quote according to your needs.